Are You Ready to Take the “Red Pill” and Enter a World of Standardized Clinical NGS Assays? As seen in the original “The Matrix,” Morpheus offers Neo two pills - a blue one and a red one. Take the blue pill and you continue right where you left off. But take the red pill and suddenly your outlook on things will change and new possibilities emerge. A similarly profound transformation is happening throughout the clinical NGS field as labs recognize that more robust QC management strategies are required to ensure the quality, performance, and standardization of results from assays across the industry. Further, labs are finding that there are purpose-built tools available that are already aligned with recent guidelines so they don’t have to spend time and money reinventing the wheel. A recent first-of-its-kind survey has revealed, shockingly, that approximately two-thirds of labs are not routinely running a commercial positive control1. This may be compounding an issue that has been identified where clinical labs are generating inconsistent NGS assay results2. The survey also revealed that labs tend to have different approaches on how and when to use reference materials as well as which methods to use for tracking, trending, and reporting QC run data. To help standardize the quality of NGS results, CAP / AMP recently released their guidance for tracking clinical NGS metrics3. There are over 22 metrics across the entire workflow that are listed in their recommendation. When you multiply some of these metrics (e.g. depth of coverage, allele frequency, strand bias, and sequence quality) by the number of biomarkers in an assay, the amount of data produced for QC review becomes overwhelming in a hurry. It is no wonder that 55% of respondents in the NGS QC survey mentioned above indicated that they would like to track and trend their QC results more easily as this is a lot of data to have to account for4. 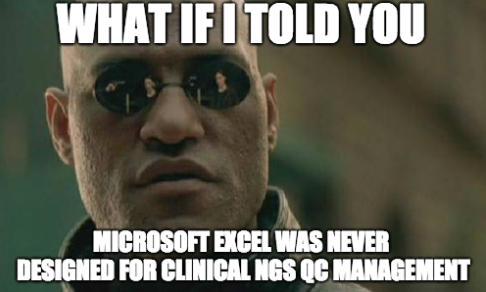 Historically, clinical lab managers have relied on Microsoft Excel for tracking NGS QC run data. However, Excel may not be the best solution for NGS QC management as vital assay performance trends might be missed while the human brain struggles to identify trends in large amounts of multidimensional data. At the same time, each lab tends to use their own custom developed Excel solution which may cause them to spend more time tinkering with Excel sheets than analyzing their QC data to help ensure assay results. SeraCare’s iQ NGS QC Management software was designed from the ground up to track, trend, and report NGS QC run data. It also assists the lab with troubleshooting sources of assay anomalies (instrument, operator, lot #, etc.) by way of a new comprehensive precision metric called the Confidence Score, which in short, is a comparison of the average allele frequency of your training set vs. that in your run. This metric can be seen as an “engine light” that can enable users to spot overarching trends in assay performance and then investigate the causes helping to stay up and running more consistently with less downtime. Additionally, the Confidence Score not only helps labs to ensure consistent performance within the same lab, but also among other labs performing the same assay. One of the benefits of a cloud-based solution like iQ NGS is that once a QC workflow has been created (either by SeraCare or the community), the workflow can be easily shared. As seen in this video, with just a few mouse clicks, labs can copy pre-developed workflows that include recommended CAP / AMP metrics and begin analyzing their QC run data almost immediately without taking up valuable time to develop custom NGS QC management tools. When combined with SeraCare’s industry-leading NGS reference materials, labs can benefit from a streamlined QC management solution that ultimately provides peace of mind by way of faster assay validation, increased uptime, and more confidence in the data being generated. In conclusion, taking the “Red Pill” is good science. The routine use of in-run positive controls to assess clinical NGS assay performance may lessen the total cost per sample by minimizing the need for sample re-runs as in-run controls provide real-time evidence that the assay is detecting what it should. At the same time, labs no longer need to use brute force to create bespoke, complicated QC management solutions in Excel. A fit-for-purpose QC management solution is now available and provides a better way to help labs more easily get up and running faster and stay up and running longer while providing more confidence in results. Learn more by watching the QC Solutions for Clinical Next-Generation Sequencing video. 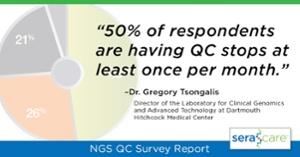 Click below to download the NGS QC Survey Report.